﻿ Fun Easy English - Environment - Global warming - Climate change Impacts on Forests. In the United States, forests occupy approximately 740 million acres, about one third of the country's total land area. America's forests provide many benefits and services to society, including clean water and air, recreation, wildlife habitat, carbon storage, climate regulation, and a variety of forest products. Climate influences the structure and function of forest ecosystems and plays an essential role in forest health. A changing climate may worsen many of the threats to forests, such as pest outbreaks, fires, human development, and drought. Climate changes directly and indirectly affect the growth and productivity of forests through changes in temperature, rainfall, weather, and other factors. In addition, elevated levels of carbon dioxide have an effect on plant growth. These changes influence complex forest ecosystems in many ways. Picture - Extent and type of forest cover in the United States. 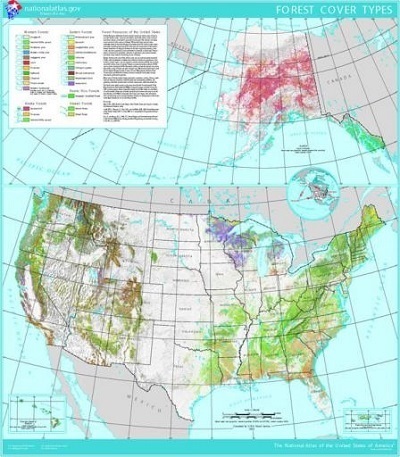 View larger: U.S. Forest Service, National Atlas. In conjunction with the projected impacts of climate change, forests face impacts from land development, suppression of natural periodic forest fires, and air pollution. Although it is difficult to separate the effects of these different factors, the combined impact is already leading to changes in our forests. As these changes are likely to continue in the decades ahead, some of the valuable goods and services provided by forests may be compromised. 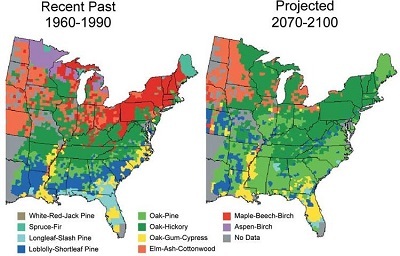 To learn more about examples of projected regional changes in forests, see the Northeast, Southeast, Southwest, and Alaska regional impacts pages. 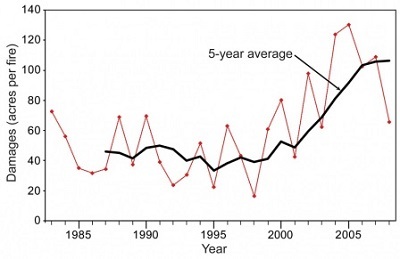 Many aspects related to climate change are likely to affect forest growth and productivity. Three examples are described below: increases in temperature, changes in precipitation, and increases in carbon dioxide (CO2). Warming temperatures generally increase the length of the growing season. It also shifts the geographic ranges of some tree species. Habitats of some types of trees are likely to move north or to higher altitudes. Other species will be at risk locally or regionally if conditions in their current geographic ranges are no longer suitable. For example, species that currently exist only on mountaintops in some regions may die out as the climate warms since they cannot shift to a higher altitude. Climate change will likely increase the risk of drought in some areas and the risk of extreme precipitation and flooding in others. Increased temperatures alter the timing of snowmelt, affecting the seasonal availability of water. Although many trees are resilient to some degree of drought, increases in temperature could make future droughts more damaging than those experienced in the past. In addition, drought increases wildfire risk, since dry trees and shrubs provide fuel to fires. Drought also reduces trees' ability to produce sap, which protects them from destructive insects such as pine beetles. Carbon dioxide is required for photosynthesis, the process by which green plants use sunlight to grow. Given sufficient water and nutrients, increases in atmospheric CO2 may enable trees to be more productive, which may change the distribution of tree species. Growth will be highest in nutrient-rich soils with no water limitation, and will decrease with decreasing fertility and water supply. Climate change could alter the frequency and intensity of forest disturbances such as insect outbreaks, invasive species, wildfires, and storms. These disturbances can reduce forest productivity and change the distribution of tree species. In some cases, forests can recover from a disturbance. In other cases, existing species may shift their range or die out. In these cases, the new species of vegetation that colonize the area create a new type of forest. Insect outbreaks often defoliate, weaken, and kill trees. For example, by 2007, pine beetles had damaged more than 650,000 acres of forest in Colorado and spruce beetles had damaged more than 3.7 million acres in southern Alaska and western Canada. The hemlock woolly adelgid, an invasive species that is sensitive to cold weather and destroys Eastern hemlock, will likely extend its habitat north as the climate warms. A lack of natural controls, such as predators or pathogens, as well as inadequate defenses in trees, can allow insects to spread. Climate change could contribute to an increase in the severity of future insect outbreaks. Rising temperatures may enable some insect species to develop faster, alter their seasonal life cycles, and expand their ranges northward. Invasive plant species can displace important native vegetation because the invasive species often lack natural predators. Climate change could benefit invasive plants that are more tolerant the environmental conditions resulting from climate change than are native plants. In 2011, wildfires consumed more than 8 million acres of forest in the U.S. (an area roughly the size of Maryland), causing 15 deaths and more than $1.9 billion in damages. Warm temperatures and drought conditions during the early summer contributed to this event. Climate change is projected to increase the extent, intensity, and frequency of wildfires in certain areas of the country. Warmer spring and summer temperatures, coupled with decreases in water availability, dry out woody materials in forests and increase the risk of wildfire. Fires can also contribute to climate change, since they can cause rapid, large releases of carbon dioxide to the atmosphere. Hurricanes, ice storms, and wind storms can cause damage to forests. Hurricanes Rita and Katrina in 2005 damaged a total of 5,500 acres of forest. The amount of carbon released by these trees as they decay is roughly equivalent to the net amount of carbon sequestered by all U.S. forests in a single year. Disturbances can interact with one another, or with changes in temperature and precipitation, to increase risks to forests. For example, drought can weaken trees and make a forest more susceptible to wildfire or insect outbreaks. Similarly, wildfire can make a forest more vulnerable to pests. The combination of drought and outbreaks of beetles has damaged piñon pine forests in the Southwest. Climate change will likely alter the frequency and intensity of forest disturbances, including wildfires, storms, insect outbreaks, and the occurrence of invasive species. The productivity and distribution of forests could be affected by changes in temperature, precipitation and the amount of carbon dioxide in the air. Climate change will likely worsen the problems already faced by forests from land development and air pollution. Changes in Rocky Mountain National Park in Colorado demonstrate the impacts that many forests are experiencing or may experience in the future. Summer temperatures have been increasing in the park, recent beetle outbreaks have been especially severe, snowpack has been melting earlier, and a nearby glacier has shrunk. Park managers anticipate additional warming, reductions in snowpack, shifts in habitats to higher elevations, and losses of some sensitive species. The National Park Service is exploring ways to manage fire risks and minimize the impacts from invasive species.